This is a great make ahead side dish and especially delicious with ham or roast beef and hearty enough to serve as a main dish for the vegetarians at your table. The horseradish added to the crumbs gives it just enough kick to make it interesting. Bring a large stock pot of water to a boil and add the cauliflower, cook until just tender about 7-8 minutes. Drain and then put on a towel to absorb and extra moisture. In a large sauce pan over medium heat combine the butter, flour, salt and dry mustard and whisk constantly until the mixture is pale and bubbly. 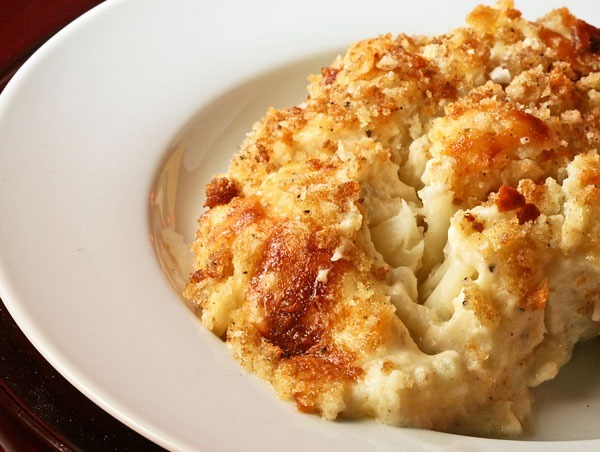 Place the cauliflower in a large gratin or 9X13 Pyrex dish and pour the cheese sauce over the top. Stir in the horseradish and toss this mixture with the panko crumbs until the crumbs are well coated and sprinkle it on top of the cauliflower. Bake for about 30-35 minutes or until the top is golden and the sides are bubbly. This entry was posted in Recipes and tagged Cauliflower, cheese, Make ahead, vegetarian. Bookmark the permalink.